The days when eyeglasses served only for vision correction are gone. Now they are among very modern, very chic and relevant accessories. If you wear the right glasses, they will enhance your natural beauty. And don’t forget that 87% of men prefer women with glasses! Choose the frames that do not hide your eyebrows. Remember, your eyebrows must be well-arched and groomed. If you wish, you can get the best shape for the eyebrows using special pencil or gel. Corrective lens can emphasize dark circles and puffiness under the eyes. Therefore, before you put on your favorite eyeglasses, correct skin imperfections under the eyes. Choose one thing: either false lashes or glasses. Huge eyelashes in contact with glasses look very strange. If you have high myopia, try to visually enlarge your eyes. However, remember to use cosmetics very carefully – glasses may accentuate facial flaws. As for eye shadows, you should use a color that complements the color of your frames. For example, if the frame is brown, you will look great with blue shadows. But if you prefer a natural look, use neutral shades of the same colors. Do not forget to use eyeliner that will make your eyes look bigger and brighter. If you have a classic brown or black frame, try bright red or pink lipstick. However, if you have colored frames, you should use a neutral matte lipstick or gloss. Use black eyeliner and gold eye shadows for dark or black frames. If you choose white frame, use blue eyeliner. For pink frame try metallic or silver makeup. Blondes should opt for bright, golden or transparent eyeglass frames (pay attention to Lightec eyeglasses or Koali glasses). Redheaded women will look even hotter with copper frames. Brunettes should opt for dark cherry or dark blue versions. Square face: choose oversized round glasses. Square and rectangular models are contraindicated. Round face: your choice is rectangular frame with wide temples. Do not wear large round eyeglasses that hide the cheekbones. Triangular face: small rectangular or square glasses with rounded edges perfectly counterbalance broad forehead and pointed chin. Avoid large frames with lots of eye-catching details. Oval face: you’re lucky to experiment with any colors and shapes. 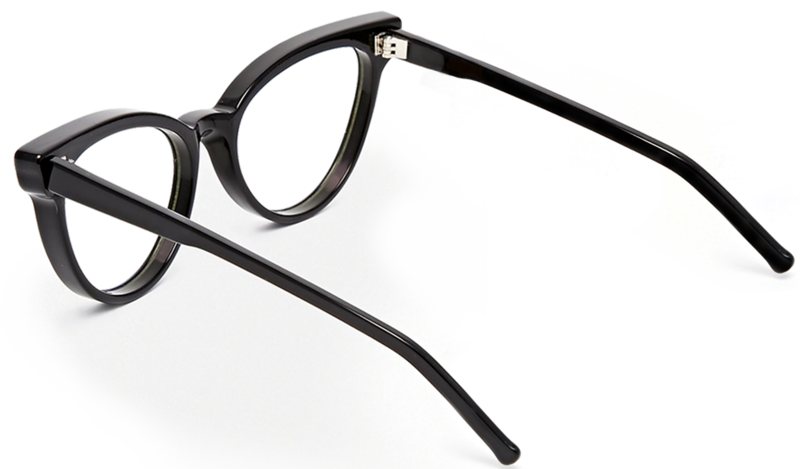 Want to focus attention on your expensive designer frames? Choose ultra short haircuts and bright eye makeup. If you are the owner of long hair, sweep your hair over one shoulder to one side. Wide eyeglasses need smooth hairstyle. Avoid creating volume at the sides of the face. If you chose glasses with big round lenses, create nourished curls and waves. Lovers of small frames should avoid straight hairstyles framing the face.